Traditional crunches tone ab muscles; adding weight can increase the challenge. When combating stubborn belly fat, cardio exercise and diet are usually the focus, but this leaves much to be desired in a well-rounded weight-loss program. Strength exercises with weights build new muscle tissue, burn calories for fat loss and increase your metabolism. Targeting your abs also turns your stomach muscles into a natural girdle, further reducing your waistline. It's easy to think of your abs as one muscle, but it's really three. The obliques run from your ribs to your hips along your sides; this muscle is engaged with twisting and side-bending movements. The rectus and transverse muscles sit along the front of your stomach. The rectus abdominals are the outermost muscles that sit on top of the transverse muscles, which help contain your internal organs. These muscles provide support and stability for your entire body during lifting activities. They also help you go from a sitting or lying position to standing. These muscles can be exercises two to four times a week, provided you rest them for at least 48 hours between each workout. Muscle failure is your body's way of saying it has worked as hard as it can. At this point, your muscle will not have much strength or power left to complete any more exercises. When you notice your muscle tiring and the exercise feels almost impossible to perform correctly, you have reached muscle failure. For each exercise you complete with weights, work until you reach this point for maximum results. Increase the size of the weight if it takes you longer than 90 seconds to reach muscle failure. This exercise allows you to use any free weight to strengthen your ab muscles. You could use a dumbbell, medicine ball or a heavy object found around the house like a gallon of milk. Stand with your knees slightly bent and your back straight. Keep your abs flexed during the entire activity to support your posture. Hold the weight with both hands at chest level and slowly rotate from left to right as far as you can. Be sure to only rotate your torso while keeping your legs stationary. This exercise also strengthens all three of your ab muscles. 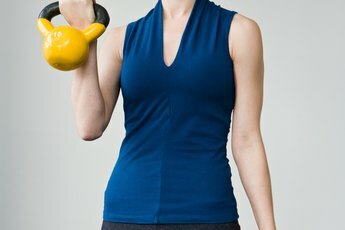 Stand while holding a weight in both hands next to your right hip. Keep your arms straight and your stomach flexed through the entire exercise. Slowly lift the weight diagonally across your body to the left. Stop when the weight is as far left and as high as possible. What Is the K2E Exercise?